The video for this story about Rikihana Carkeek and the Maori Contingent screened on TV3 News on 6 August 2014. Rikihana (Bunny) Carkeek was a prominent Ngāti Raukawa leader from Ōtaki who served with the Maori Contingent and the Pioneer Battalion during the First World War. 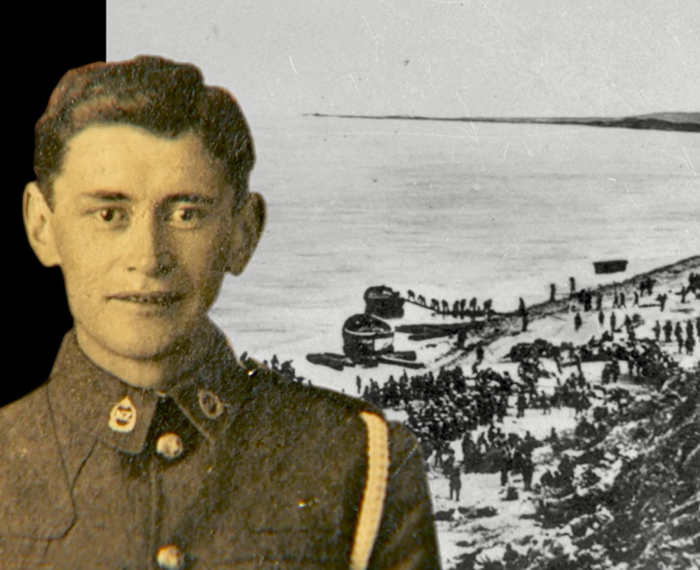 He kept a detailed diary which provides great insight into the experience of Māori soldiers. At Gallipoli nearly all of his machine-gun crew were killed or wounded during the attack on Chunuk Bair. Carkeek survived both Gallipoli and the Western Front, and returned home an officer. Rikihana (Bunny) Carkeek was born in Ōtaki on 23 March 1890. He was the son of Raita Rikihana and her husband Morgan Carkeek, from a prominent Ngāti Raukawa family. After his mother died when he was a baby, her family cared for him. Rikihana was educated at Te Aute College in Hawke’s Bay, and was working as a clerk for Parata and Co. in Wellington when war broke out in August 1914. He volunteered almost immediately – one of hundreds of young Māori men keen to serve overseas. Despite the willingness of many to fight, Māori were not initially welcome recruits. Imperial policy initially opposed the idea of indigenous peoples fighting in what was seen as a ‘white man’s war’. The New Zealand government changed its views once it became apparent that Indian and African troops would take part in the conflict. In September 1914 Prime Minister William Massey announced that the British government had accepted the offer of a 200-strong Native Contingent for service in Egypt. This force increased to 500 men following another New Zealand request, with the balance set for occupation duties in German Samoa. Recruitment of the contingent began in late September under the direction of a Maori Recruitment Committee (MRC) consisting of the MPs for the four Māori seats – Peter Buck (Te Rangi Hīroa), Māui Pōmare, Āpirana Ngata and Tame Parata – and the MP for Gisborne, Sir James Carroll. Eventually more than 2500 Māori soldiers served overseas. This was a substantial commitment from a Māori population of 63,000. Wartime recruitment was variable – some communities volunteered in large numbers, others did not contribute at all. This reflected the experiences of different tribes during the New Zealand Wars of the 19th century. Tribes which had been neutral or allies of the Crown, such as Te Arawa, Ngāti Porou and Ngāpuhi, were more likely to volunteer for the war. Those tribes that had fought the Crown and suffered land confiscation, such as the Taranaki, Tainui and Tūhoe peoples, produced few volunteers. Carkeek was among the first volunteers from Māui Pōmare’s Western Maori electorate. He marched into the contingent’s training camp at Avondale racecourse in Auckland on 19 October 1914. Here, the contingent was organised into two companies with platoon groupings based on tribal and geographical origin. Carkeek joined A Company’s No. 4 Platoon with other men from Horowhenua, Wellington and the South Island. In November 1914 the government announced that the entire contingent would be heading to Egypt. The change was made because of concern that the Samoan population might react badly to a Māori garrison (guard) force. After completing their training in Auckland, the Maori Contingent sailed for Egypt from Wellington aboard the SS Warrimoo on 14 February 1915. The contingent was dubbed Te Hokowhitu-a-Tū (the two-times-70 warriors of the war god Tūmatauenga) by Te Aitanga-a-Māhaki chief Wī Pere. ‘Two-times-70’ was a reference to 140 being the favoured size of a traditional Māori taua (war party). The unit’s badge consisted of two traditional Māori weapons – taiaha and tewhatewha (both fighting staffs) – crossed through a crown. Sent to garrison the island of Malta in April 1915, the contingent missed the early stages of the Gallipoli campaign. As casualties on the peninsula mounted, the British government asked that the Māori reinforce the depleted New Zealand brigades. Carkeek landed with the contingent at Anzac Cove on 3 July 1915. They went into the line at No. 1 Post – a position soon known as the ‘Maori Pa’. The contingent helped dig trenches and carried out other labour tasks, as well directly engaging the Ottoman forces. During the August offensive, Māori platoons attached to the New Zealand Mounted Rifles Brigade helped secure the approaches to Chunuk Bair on the night of 6 August. These soldiers were heard performing Te Rauparaha’s famous ‘Ka mate’ haka as they cleared the Ottoman trenches. Attached to a machine-gun section, Carkeek remained behind to defend No. 1 Post during the initial attack. Later his section moved up Rhododendron Spur to support the assault on the summit of Chunuk Bair. By dawn on 8 August Carkeek’s machine gun was in position near the Apex. Exposed to enemy fire from nearby high points, his section suffered heavy casualties. Carkeek was shot through the base of the neck, but managed to drag himself to the beach and eventually boarded the hospital ship Sicilia. After recovering from his wounds on Lemnos, Carkeek returned to Gallipoli in November and saw out the rest of the campaign. He was one of only 134 Māori soldiers from the original 477-strong contingent who survived to be withdrawn from Gallipoli on 14 December 1915. The Maori Contingent, along with the shattered Otago Mounted Rifles, were formed into the New Zealand Pioneer Battalion in February 1916. Pacific Island soldiers, including Rarotongans, Tongans, Niueans and some Samoans, supplemented Māori reinforcements. The battalion adopted a new badge with a Māori warrior’s face above crossed pick and axe and the words ‘NZ Pioneers’. Once there were adequate reinforcements to fill the battalion, it became the New Zealand Maori (Pioneer) Battalion in September 1917, with its original badge restored. Carkeek travelled from Egypt to France with the Pioneer Battalion in April 1916, but contracted tuberculosis next month. Invalided to the United Kingdom, he spent four months convalescing in military hospitals before heading back to France in October 1916. A succession of promotions saw Carkeek reach the rank of company quartermaster sergeant in September 1917. He was selected for officer training in December 1917, but illness cut short his training in the United Kingdom and he did not receive his officer’s commission until January 1919. The New Zealand Maori (Pioneer) Battalion returned to New Zealand aboard the Westmoreland in April 1919. The only NZEF battalion to return home as a complete unit, it received an enthusiastic welcome with parades and receptions around the country. Rikihana Carkeek returned to Ōtaki and married Pareraukawa Atkinson. After farming near Picton in Marlborough and Rangiotū in Manawatū, they moved back to Ōtaki in the 1920s. He later served as an interpreter for the Maori Land Court and was prominent in Māori and civic affairs in the Ōtaki district. Rikihana Carkeek died on 24 January 1963, aged 72. Following a tangi at Raukawa marae, he was buried at Ōtaki Cemetery. These extracts from Rikihana Carkeek’s diary are reproduced from Home little Maori home, 2003. … Men from the Northern Districts were already in [Avondale] camp when I arrived on the 19th with the South Island and Wellington quotas. The Northerners, therefore, had the honour of pitching the first Maori camp of its kind. Batches of men arrived daily for about a week or so afterwards, each representing a tribe or sub-tribe …. It was now broad daylight, about 5 a.m. on Sunday morning. We quickly surveyed our sector and our officer, in full view of the Turks no doubt, rapidly located their position, bearings etc., and our range at 300 yards, so we opened fire at that into what seemed the advancing mass of Turks. Those of us who were waiting for our respective turns on the machine gun opened fire with our rifles. As soon as we arrived we were immediately in our proper battle formation. As No. 1 on the gun … Corporal Ferris opened fire on the enemy in our immediate front. We were in a terribly exposed position and all the rifle fire of the Turks seemed to converge on our position; we were at the apex of the line. Bullets seemed to be whizzing and sputtering from all sides, right, left and front. Just after our officer, Lieutenant Waldren, had given us the range he was shot and fell back amongst us in a heap. He managed to say, ‘Carry on boys’, then he died in the arms, I believe, of Private Lucas who was No. 5 on the gun. Almost immediately after the loss of our leader, our gun corporal Donald Ferris was shot through the head and killed instantly and I dragged him away from the gun and laid him beside our officer. No. 2, Private F. Hawkins, took charge of the gun and I moved up into position to feed the belt. Shortly afterwards he was out of action, shot through the wrist. Then I took charge and opened fire at 250 yards. I also did not reign long for I was shot through the body at the base of the neck and out under the left shoulder, and I fell back wounded and out of action. No. 4, Roy Devon, took charge. He was badly wounded, followed by J. Lucas, wounded. I hardly remember what followed afterwards. Though I had my senses, I kept cool as I lay behind our gun and under cover thanks to the attention of J. Rata who bandaged me and helped me into a fairly safe spot. However, our gun was in action all the time though we suffered severely; practically the whole gun team was out of action. Yet the survivors managed to keep the old gun going though she had a few holes in her water cylinder. I do not know what was happening beyond the skyline but as I lay in the scrub the heavy rattle of rifles and machine guns convinced me that the fight was at its height. At 5 p.m. we were told to fall in, ready to move off again, hoping for better luck this time. We moved off at five thirty, all present and no-one hit, and marched down to the jetty. It was good going this time with hardly a stop on the way. Said goodbye to the old No. 1 Post as we passed. We embarked on the barge and ‘Fineesh’ Gallipoli. By 7.45 p.m. we were on board the big transport packed full of troops, Ghurkhas, Aussies and Kiwis. Safe at last on deck at eight o’clock, I had my last look at good old Anzac, listening to the gunfire going on. It’s a most beautiful night and Anzac Cove looks grand. Barge after barge is coming off the Peninsula. So far the Turks do not know that we’re leaving. What a great relief after the awful suspense of waiting and waiting on the beach and the slow and tedious tramp along the communications trenches and saps and down those gullies. At 9 p.m. one of our cruisers is bombarding and ‘rattle rattle’ go the rifle and machine guns, then quieten down to the normal random and monotonous fire we’ve been used to of late. I’ve been standing on deck, leaning on the rails and having a good long last gaze at Anzac. I can see the dark irregular shapes of those terrible heights of Gallipoli, the occasional flash of firearms and bursting of bombs (good old jam tins), star shells, etc. My thoughts are many. Gallipoli has been an infernal hothouse, a perfect hell on earth, but it’s hard to leave the place. I will never forget Gallipoli and its memory will ever be sacred to the gallant dead. Ngā pakanga ki tāwāhi – Māori and overseas wars, a story on Te Ara. Maori Units of the NZEF, a story on NZHistory.